Start in a 1-4 formation. 2 gets a screen from 5 and takes the position of 3. 3 goes down to the baseline corner. Pass from 1 to 2. 1 cuts to the weak side baseline corner. 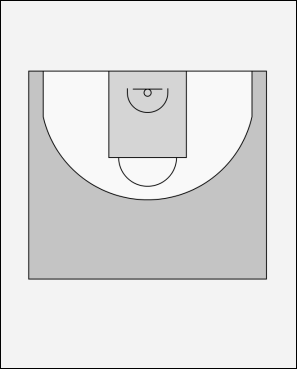 4 sets a screen for 5 and steps outside the 3-point area. 5 plays a side pick and roll with 2. After the pick and roll 2 can shoot or pass to 1, 3, 4 or 5. Note that all corners are covered.